You maybe wondering why I’m posting about it a day late. Two reasons: 1. I was such a dribbling wreck yesterday from all of the chemo drugs I’m on that I could barely string a sentence together let alone write a blog post, and 2. everyday is metastatic breast cancer day if like myself, you are living with the disease. 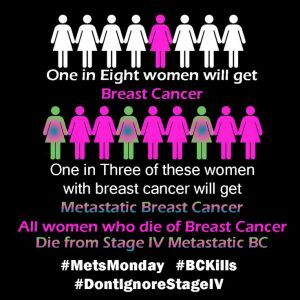 US statistics show that 1 in 8 women will have breast cancer in their lifetime and a third of them will go onto develop metastatic breast cancer, I’m sure UK figures are pretty similar. I have tried to conduct some scientifically proven fact based research but am very much hindered by the fact that I’m working off my mothers antique PC which takes Google around 47.9 seconds to perform each search. Writing this blog post has taken the best part of the day and has been a pretty painful process (almost as painful as the side effects from chemo yesterday). I found this Cancer Research UK breast cancer stats webpage for some figures but I endeavor to get some more relevant and solid stats when time and technology allows. 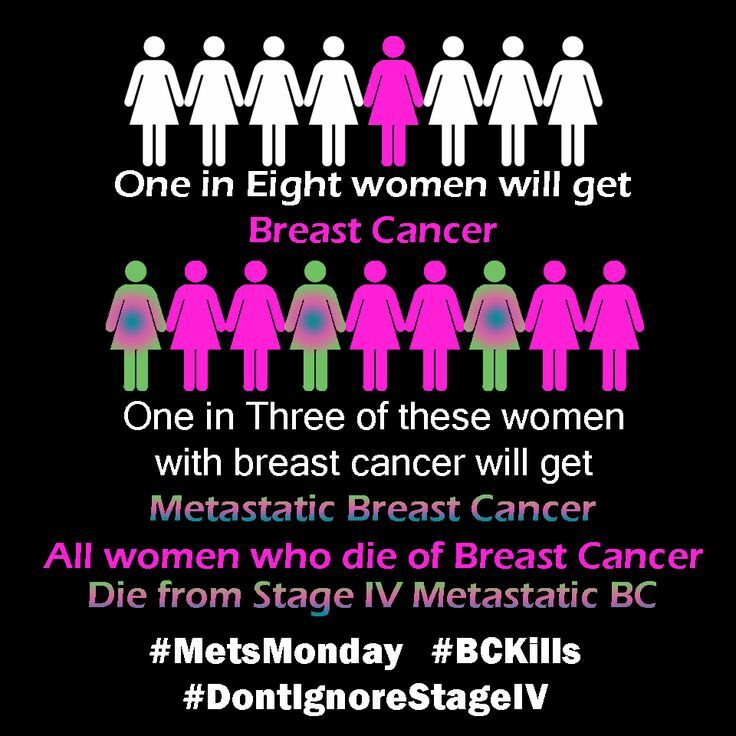 Just to make things plain and simple for those who do not know what metastatic breast cancer is (it’s the type I have been recently diagnosed with). Metastatic breast cancer occurs when the cancer spreads (or metastises) from the breast to other parts of the body; usually liver, lung, bones and brain. Metastatic breast cancer kills 100% of sufferers. In the US I have seen figures reported that between 2-5% of money raised goes towards metastatic breast cancer research, this is a teeny tiny amount. I have no idea what the figures are for the UK but suspect it is something similar. I cannot seem to find a reputable source that lists where our fundraised money is being spent. If anyone has any idea where I can find these figures, please send me your answers on a postcard. I do know that I want to make it my mission to find out about fundraising, question where all the money is going and why isn’t more being spent on research to find better treatments, not just for metastatic breast cancer, but for ALL cancers. I want to campaign for more of our fundraised money to reach the scientists and researchers that need the funds to develop ground breaking drugs and treatments and get them through clinical trials so they actually reach the people that need them. I want to campaign for research into why so many more younger women are getting breast cancer, environmental factors, genetic mutations, endrocrine disruptors, the list seems to be never ending. There is so much I want to shout about that my head turns into a hot tub just thinking about it. I may not be the most scientifically informed person out there but I want to learn and I want to make a change. After all knowledge is power and it seems to me that the answers to my above questions are increasingly difficult to find. I recently posted this article from the Telegraph ‘Is it time for the public to start funding cancer research?’ where journalist Alexander Masters discovered a breakthrough cancer treatment had been shelved due to lack of funding. I really think this is the direction in which we need to be going with our fundraising. I’m not sure how and I’m not sure if this is already being done but I want to find out. What I took from yesterdays campaign is the message that things need to drastically change in the world of fundraising both in the US, UK and all over the world. Too much emphasis is given upon messages of ‘early detection’ and ‘survivorship’ when people all over the world are still dying from this under researched and still incurable disease. I apologise if this blog post has come across as vague and under researched, I know that it is and there is so much more I want to learn. All comments are gratefully receievd, especially those on UK fundraising and research and where I can find facts and figures. Most of the big charities have committees that decide where the money goes. I’m sure it’s possible to get lists of these decisions. Certainly the vast majority that goes toward research goes into chemo or radio of one type or another when we know those things are never going to be proper cures. And a lot of projects like the one in the article I sent you don’t get funded because 1) they aren’t “safe” bets in that they might not work at all and 2) a lot of them use techniques which can’t be patented, which means even if the research did get funded, pharmaceutical companies wouldn’t want to produce the resulting medicines because they would be far less profitable than chemo. I think a change in the law is needed to really alter things.